HMS Victory; Lord Nelson's Flagship HMS Victory: Victory's history and restoration in Portsmouth UK. HMS Victory, Admiral Lord Nelson's flagship is the oldest commissioned warship in the world and is still manned by Officers and Ratings of the Royal Navy. The Victory is the only surviving warship that fought in the American Revolution, the French Revolution, and the Napoleonic Wars and is now the flagship of the Second Sea Lord and Commander in Chief Naval Home Command and lies in No 2 Dry Dock at Portsmouth Naval Base in Hampshire UK, where she has a permanent berth. 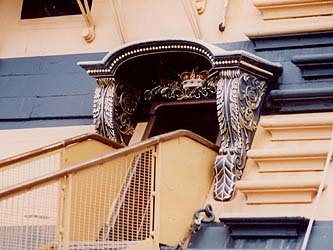 The design of HMS Victory's elaborate figure-head comprises of two cupids supporting the royal coat of arms which is surmounted with the royal crown. The motto bears the Latin inscription of the Order of the Garter: Honi Soit Qui Mal Y Pense. Translated this means: Shame to him who evil thinks. HMS Victory is an 18th century first-rate warship. it has four masts, 104 guns and took six years to build at a final cost of £ 63,176, a present day cost of around £50 million pounds. The main function of the first-rates warship like HMS Victory was a floating gun platform to deliver shattering 'broadsides' from their powerful batteries of guns arranged in tiers on three decks. The term 'first-rates' warship came from the battle strategy of the British Royal Navy and the old square riggers. In battle the ships would line up astern of each other and sail in a line past the enemy, when the ship was abeam of their opponent they would then aim and fire their guns. The guns use in this period could not be turned and aimed at their targets like modern turret guns, so sailing in a line meant they had to bear a long onslaught for an extended period. On the 13 December 1758, the same year of Lord Nelson's birth the Board of Admiralty in London gave orders that twelve new line of battle ships were to be built, among them a 'first-rate' with 100 guns. In 1759 it was decided that this ship would be called Victory. She was designed by Thomas Slade, the Senior Surveyor of the Royal Navy and was laid down in Chatham Dockyard in Southern England. According to reports at the time it was a "bright and sunny day" when the elm keel was laid down in the old single dock at Chatham dockyard in Kent on 23 July 1759. Forty-seven years later on the 21 October 1805, HMS Victory was the flagship of Vice Admiral Horatio Lord Nelson at the Battle of Trafalgar. This sculpture of HMS victory has been carved entirely from centuries old oak beams removed from HMS Victory’s lower gun deck during the restoration program in 1991. 1759 Keel laid -- 1765 Launched -- 1778 First commissioned -- 1781 Battle of Ushant -- 1782 Relief of Gibraltar -- 1783 End of the American Revolution -- 1793 First refit along with an increase of armament -- 1794 French Revolution -- 1795 Refits at Portsmouth and Chatham --1797 Battle of St. Cape Vincent -- 1798 Battle of the Nile -- 1801 Battle of Copenhagen -- 1804 The 4th refit at Chatham was completed -- 1805 Lord Nelson, Battle of Trafalgar -- 1806 Extensive repairs at Portsmouth - 1808 Re-commissioned, two Baltic campaigns - 1817 Put into reserve -- 1824 Flagship for the Port Admiral -- 1889 First made the Flagship for Commander-in-Chief -- 1903 Accidentally rammed while under tow -- 1922 Placed into No 2 dry dock for restoration which continues today. Due to the complex design and construction of a first-rate warship like the Victory, today it would be a massive industrial undertaking to attempt to build a ship of this size entirely from timber even with all the modern facilities and equipment assuming you could still find a suitably skilled workforce. The original 18th century workforce were not only having to use rather basic equipment and tools but also had all the logistical problems of moving massive timbers from were they were felled to the dockyard. The task itself incorporated a huge sum of money, a vast highly skilled and motivated workforce along with a small forest of trees. Certain sections of a ship framework the size of the Victory had to be made from a single piece of oak, therefore oak trees with massive dimensions were very much sort after. The oak tree required for the 30 feet high 'stern post' which took some of the greatest stresses of the ship were just one such tree, as stern posts made from joined up timbers would soon fail. Other prized oak trees were those with 'compass timbers' which had grown over the years with stout curved branches which enabled the knees and clamps to also be made from one piece. One of the most difficult of these trees to find was the timber to be used for the wing transom, this had to be made from an uncommonly widely forked stem mature oak tree. The normal list of supplies required to build a ship of the line would consist of almost a hundred acres of oak forest, well over 5000 carefully selected mature oak trees which were mostly obtained from the weald forest of Kent and Sussex and the remainder of the timber required was elm, pine and fir which once stored would have been left seasoning for several years. Many of these massive oak timbers particular for the outboard planks were bent to the correct shape by being placed over a pit with fire underneath; water was than poured over the timber and heavy weights placed along the sections of the timber until it reached the correct curvature. The thickness of the hull at the waterline on the Victory is approximately 2 feet (0.6m) thick. Seven large elm trunks were used for the keel and around 3000 feet of fir and spruce were required for the decks, masts & yard arms as this type of timber was light and very supple. The bottom section (lower masts) were made from 5 to 7 trees which were bound together with iron hoops. The masts used 27 miles of rigging and carried four acres of canvas for the sails and 2 tons of iron and copper nails and bolts. These bolts which were passed right through the carefully shaped beams and sophisticated joints had the ends clenched over washers, all this basically held the whole ship together. Below the water line the ships oak hull was covered with 3923 pieces of 4ft by 1ft copper sheeting weighing 17 tons, this sheeting was added in 1780 as a protection against the teredo worm. All the time, expense and difficulties involved with trying to build a ship the size of the victory was one of the reasons in times of war it made more sense to try and take the enemies ships with boarding parties and keep them as prizes, rather than sinking them. Despite her size HMS victory was very efficient, although first-rate warship like the Victory were made entirely from wood they rarely burned and even if they were holed they were virtually unsinkable as wood being naturally very buoyant. These ships carried amongst their crew carpenters, ship wrights and sail makers and could therefore be repaired at sea by their own crew. The wind gave them unlimited propulsion and therefore essentially an unlimited range. The Victory's size also made her essentially a good load carrier of food, ammunition and water, which enabled them to stay at sea for many months at a time. 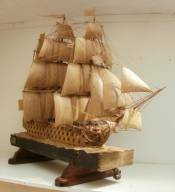 HMS Victory was launched on Tuesday 7th May 1765, timber for constructing a first rate warship like the Victory was placed in store to season for some 14 years before construction began. It is very probable that this long seasoning time greatly contributed to the ship's eventual longevity, although it was not until the American War of Independence in 1776 when she was finally completed and fitted out. In 1778 the Victory was eventually commissioned, however this further extended period of weathering meant that the hull timbers were particularly well seasoned, although ships during this period were just often built to fight the war that was on at the particular moment, the ships were not expected to last for centuries. At first around 250 men were employed in one form or another in the ships construction, but with the changing fortunes of the current war with France, the workforce was reduced in 1761. When the Seven Years War ended in 1763 further employees were made redundant as work to complete the ship became less urgent. She was eventually floated out of the dock at Chatham Dockyard in Kent on Sunday 7th May, a blustery day and towed away to be ballasted. It was then discovered the Victory had a significant list to starboard which took thirty-four tons of shingle ballast before this was corrected. The ship was then completed for the 'ordinary' ( in reserve ) before being laid up. It was not until the American war of Independence which began in 1775 was the Victory ordered to be completed for sea and her first commission. In March 1778 the Victory's first Captain, Sir John Lindsay took command and a month later she slipped her moorings and sailed to a point just above Sheerness. On Friday 8 May 1778, she finally set sail out to sea for the first time exactly 13 years and a day from the time of her launch. Her active service life began on Friday 13 of June when she sailed from Spithead as the Flagship of the Channel Fleet. She first cleared for action on the 23 July. Fighting ships of the Royal Navy sailing era were divided into six 'rates', according to the number of guns they carried and the size of their crews. The first- rates were the largest and most powerful type of warship afloat at the time. They carried over a hundred guns and more than eight hundred officers and men. Her excellent sailing qualities and the extra space available for the crew made her a very popular choice for use by Admirals as their flagship. When an Admiral was on board, his presence was indicated by flying a special flag and so an Admiral's ship then became known as the ' flagship'. In Nelson's time, ships were also painted to suit the tastes of individual Admirals and Captains, the Victory was painted to suit Nelson's personal choice and was subsequently called by the Fleet ' Nelson's Chequerboard. The Victory having 3 masts and a bow sprit is known as a 'ship rigged' vessel. Each of these masts supports yards ( horizontal spars) which are named after their respective masts, the lower yard, topsail yard and the topgallant yards. These masts and yards were made from either fir or pine as this timber is very supple and light in weight. As the masts were so large it took up to 7 trees to make each mast, all of which were shaped and fitted together with iron hoops and then bound tightly with ropes. Over 26 miles (42 km) of flax and hemp rope was required to rig the Victory, with the largest rope being 19 inches (47 cm) in circumference. A set of canvas sails for the Victory comprised of 37 sails which providing a total sail area of 6,500 square yards (5, 428 square metres) around four acres of sails An additional 23 sails were carried on board as spares. The largest single artefact that still remains from the Battle of Trafalgar is HMS Victory's Fore Topsail, which measures 54 feet high by 54 feet wide at the top and 80 feet wide at its base, this sail covers an area of around 3,620 square feet and weighs around 370 kilograms. 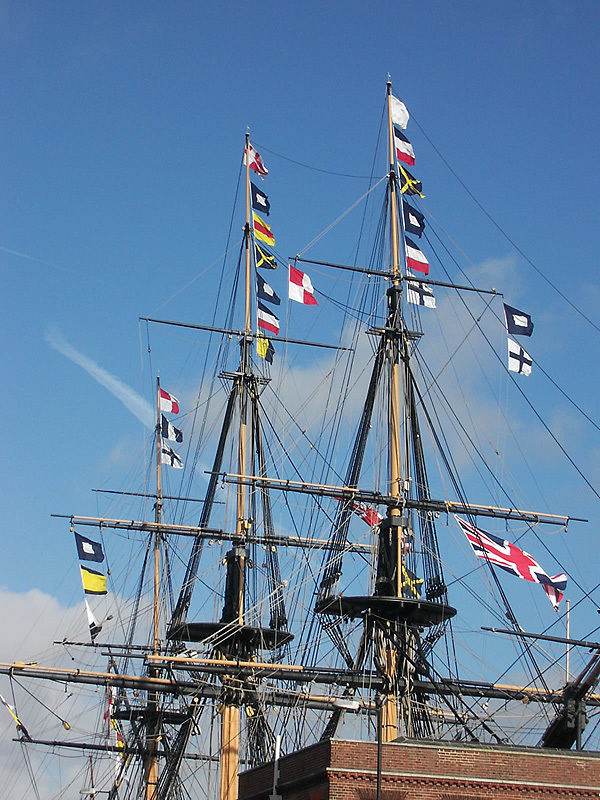 The sail was initially made in the Sail Loft at Chatham when HMS Victory was completing her repair in 1803 by Dundee weavers who used to manufactured the bolts of cloth for the Navy during this period and would have spent around 1,200 hours to stitch the top sail together and remained on board the ship until it was returned to the sail loft after the battle in 1806 for repairs. This surviving topsail is pot marked by over 80 holes and tears in the canvas sustained both in the battle and afterwards by 19th century souvenir hunters. The sail was again removed from the ship during 1934/5 and was later discovered in the gymnasium in the Royal Naval Barracks in Portsmouth. In 1967 it was returned to the ship and displayed in the Larboard Cable Tier on the Or lop Deck. This unique and historic Topsail which is the only sail in existence from the battle in 1805, was exhibited in No 4 Boathouse in the Royal Naval Dockyard during the International Festival of the Sea in 1998, before being removed for further restoration. This was the first time the sail has been hoisted since the Battle of Trafalgar. HMS Victory's fore top sail is a unique artefact from the battle and the period, the fact it remains intact today is a testament to the skill of the Georgian sail makers who manufactured the sail over two centuries ago. To preserve the sail for the future it is now being stored in environmentally controlled conditions in Store 10, in the Portsmouth Historic Dockyard. Nelson's famous signal "England expects that every man will do his duty"
Trafalgar was considered to be the most decisive naval battle, both tactically and strategically in history and it was in 1899 that the custom to fly Nelson's famous 'England Expects' signal from her masts every Trafalgar Day first started. This signal is run up the mizzen mast each year on the 21st of October the anniversary of the Battle of Trafalgar and requires 12 successive hoists for it to be complete.. The first official Admiralty signal book with its numeral code flags was only introduced in 1799 just six years before the battle, following many years of development by individual officers. The inventor of the code from which all later signal books were developed was Rear Admiral Sir Home Popham and was introduced to the fleet in 1801. The 6 boats that were carried aboard HMS Victory comprised of a Launch; Barge; Pinnace and 3 Cutters were an essential part of the ship's equipment. These boats were used for many purposes including conveying stores, personnel, mooring and anchoring the ship. They were also employed as 'tugs' for towing when the loss of wind becalmed the ship. There were 3 cutters, two of 25 foot (7.6m) in length, the third 18 foot (5.5m) long,. and were slung out on davits and were in effect the ships sea boats. The Launch was the largest of the boats on board being 34 feet (10.3m) long and as well as carrying men and stores, was used for such tasks as the anchor work. For such tasks it was therefore equipped with a windlass which assisted raising the anchors and a small wooden crane (davit ) for retrieving the anchor buoy. The boat although usually rowed by 16 oarsmen seating 8 either side, it could also be sailed using two masts and a cutter rig. During battle the boats were often towed astern of the ship to keep them out of the way and also to reduce the potential collateral damage of additional splintered wood flying across the deck if the boats were hit by enemy cannon shot. 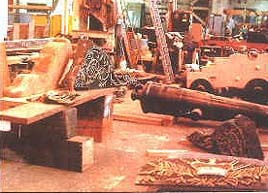 As much removable wooden objects as possible was sent below, mess tables, benches, the officers' furniture and sea chests. Clearing the decks for action was called to reduce one of these main dangers during naval engagements, a well drilled crew could clear a ship the size of the Victory in about ten minutes. 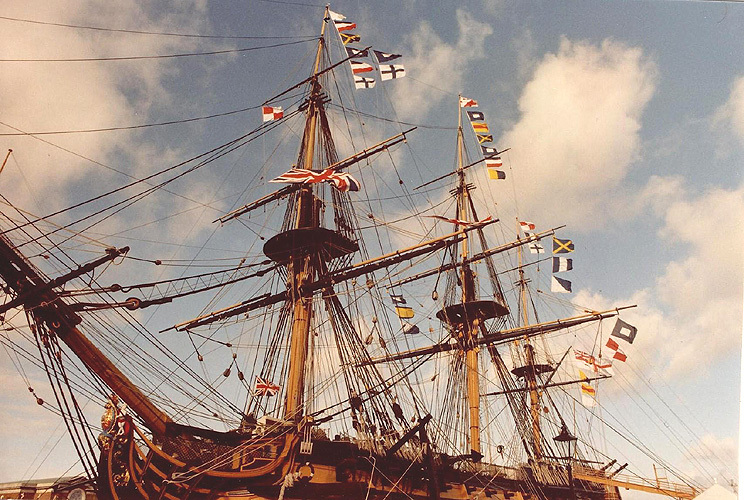 When in full sail HMS Victory carried thirty seven different sails. These canvas sails were mostly hung from horizontal ' yards' mounted on the her four masts, the bowsprit, the foremast, the mainmast and the mizenmast, various combinations of these sails were used according to the strength and direction of the wind. HMS Victory's excellent design, speed ( around 8 knots - 10 mph ) and the ships manoeuvrability despite her size meant she was in constant demand during her main period of active service between 1778 and 1805 and became the most successful First Rate warship ever built. 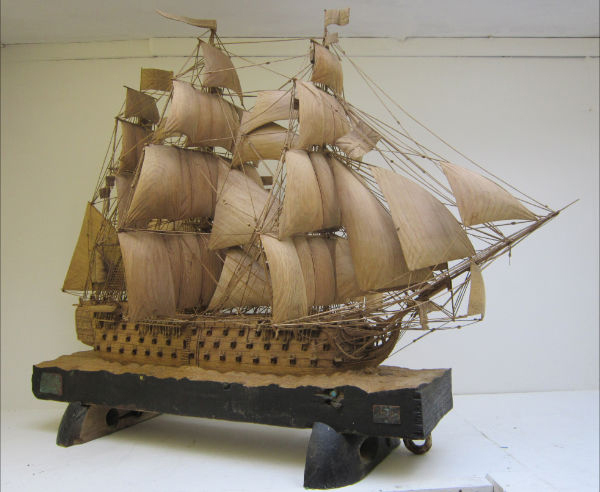 The configuration of HMS Victory's full set of sails as shown on Ian G Brennan's Victory sculpture which has been carved entirely from original Victory oak. The Victory carried 7 anchors of various sizes for different uses; The 'Best Bower' anchor served as one of the two main anchors used for holding the ship in deep water. Being the heaviest and strongest, it was always rigged on the starboard (right hand) side of the ship because of the prevailing winds often found within the northern hemisphere. Weight 4 tons. 9 cwt. 1 qtr. 14 lbs. (4.54 tonnes). It was a major undertaken to raising the anchor on board HMS Victory and as there was no mechanical means of doing so this had to be done by manually. At the centre of the ship were two capstans which were connected together vertically. Each capstan could take 12 capstan bars and each bar had space for six men so in total of 144 men would walk around the capstan pushing against the bars to raise the anchor. 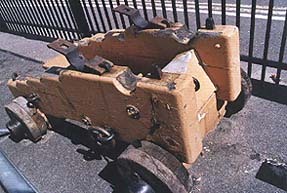 The heavy anchor cable was carefully coiled down in the cable locker however as wet cable rotted rapidly the bulkheads are perforated to allow air to circulate which allowed the cable to dry. The Middle Deck had twenty eight - 24 pounders ; the Lower Deck thirty - 32 pounders ; the Upper Deck thirty, 12 pounders; the Quarter Deck twelve -12 pounders ; the Forecastle had two - 68 pounders ( Carronades ) and two - 12 pounders ( Bow- chasers). All the guns on the Victory were smooth bore muzzle loaders which fired a single shot which made them short ranged. Three main types of shot were used in the guns were 'round shot', used to batter the hull of an enemy ship; 'dismantling shot', to tear down the masts and rigging of an opponent ship, anti-personnel shot ''grape shot', which was used to kill or maim members of the opposing crew. A 'broadside' from the ships main armament came from 32 pounders which were often discharge from all the guns from one side of the ship. More usually the guns were fired one by one from bow to stern in a ripple effect. 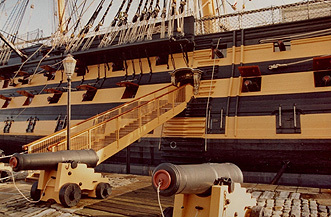 HMS Victory's firepower alone was superior to all of Wellingtons cannons used at the Battle of Waterloo. The wooden construction of these ships gave good protection against solid shot as the wood absorbed much of the shock, although ricochets and splintered pieces of wood were a major problem, especially if the ship was to suffer a direct hit perhaps through one of the open gun hatches. The cannon shot would often cause devastating damage to both the interior of the ship and the opposing gun crew themselves. Guns could often be torn loose from their ropes and with the constant motion of the ship in open sea, a 'loose cannon' weighing over a ton moving back and forth on its own, would often compound the horrific injuries to the crew. .
Three main types of shot were used in the guns: 'round shot', used to batter the hull of an enemy ship; 'dismantling shot', to tear down the masts and rigging of an opponent ship, anti-personnel shot ''grape shot', which was used to kill or maim members of the opposing crew. A 'broadside' from the ships main armament came from 32 pounders which were often discharge from all the guns from one side of the ship. More usually the guns were fired one by one from bow to stern in a ripple effect and had a maximum range of one and a half miles. The combined weight of the carriage and gun was three and three quarters tons. The shock of such a broadside caused such great a strain on all the ship's timbers that the guns were very rarely fired all at once. A shot from a 32 pounder guns could penetrate 2 feet thick oak from around 1 mile away. Nelson perfected a way of skimming the gun shot off the water like one might do with a pebble, which added to the force of the shot into the hulls of the enemy ships, with devastating effect. When the enemy was sighted, the Royal Marine drummer would sound a special drum roll: 'Beat to Quarters!' which is the modern day 'Action Stations!' Immediately the crew would clear the decks for action and 'man there guns'. Each cannon had its own crew which was typically twelve men and a boy, known as the 'powder monkey', who collected the gunpowder filled cartridges from the magazines deep down in the bowels of the ship, below the waterline and therefore safe from enemy shot. 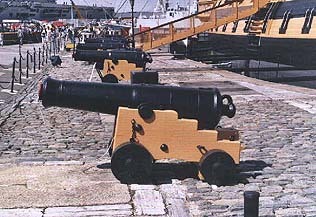 The Royal Naval gun crew would go through a complicated drill to prepare their guns for firing, constantly practiced this drill and by the time of Trafalgar, most British warships could fire a broadside every ninety seconds which was often twice as fast as their French and Spanish opponents. These fast and deadly hailstorms of concentrated fire gave the British an all important advantage in any battle. Even after a constant barrage of cannon shot which inflicted tremendous damage, as these great wooden ships were very buoyant they rarely sank in battle. So instead they had to be captured by boarding parties. Although most great naval battles would often begin with great lines of opposing warships sailing past each other firing broadsides, these gunnery duels often reached no real conclusion. The battles frequently ended up with close-quarter hand-to-hand fighting between the crews of individual ships which often ended up tightly wedged alongside each other. In these often murderous contests boarding pikes, cutlasses and pistols were used, with covering musket fire from the Royal Marines who could be found firing with great accuracy, sometimes from high up in the rigging. A standing joke within Portsmouth dockyard is that HMS Victory took six years to build and 240 years to restore; not only has the warship had to suffer many years of hostile action, ravages from the death watch beetle and Toledo worm but also human neglect. In 1812 the Victory was finally taken out of active service and was again placed ' in ordinary ' in Portsmouth Harbour, she was then fitted out as the flagship of the Port Admiral and moored close to the harbour entrance where she remained throughout the rest of the nineteenth century. She was then used for accommodation, storage and even a prison ship, in 1903 she was rammed and badly damaged by the warship HMS Neptune and almost sank. 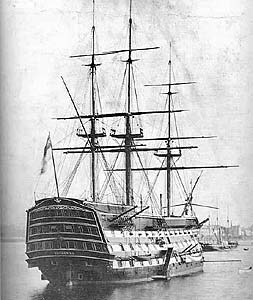 By 1920 HMS Victory had become a 'hulk' moored in busy Portsmouth Harbour. At this point, it was decided that she had to be restored, or lost forever. A survey at the time revealed that much of her huge oak timbers were rotting and worm damaged, a great deal of restoration needed to be done. On 12 January 1922 the Victory was eventually moved into her present dock from her berth which was off Gosport, into No 2 Dry Dock within Portsmouth Royal Naval Dockyard. She was relocated for the last time on 8 April 1925 and since that time has been undergoing extensive restoration by the Royal Navy with assistance from the Society for Nautical Research. Due to enemy action the masts and parts of the structure required replacing, at the battle of Trafalgar alone the ship took a fearsome battering for almost an hour exchanging broadsides with the French ship Redoubtable the two ships only two feet apart. After that epic battle the Victory then took another pounding this time by the elements in a great storm and had to towed to Gibraltar to be patched up for the sea journey back to England for major repairs. Much of the hull has been rebuilt or replaced over the years and many areas within the ship itself have been reconstructed. To mark the centenary of Trafalgar in 1905 the Victory received some cosmetic treatment but it was not until she was moved into the dry dock did real work begin to restore this unique warship. When the Victory entered the dry dock it was discovered her bow had dropped by 18 inches, the stern was down by 8 inches and the elm keel was found to be distorted. Sadly however today only about 20 % is now left of the original vessel built in 1765. However the further down the ship decks you go the more original the ship becomes with around 90% of the lower gun deck being original, the or lops lower gun deck is 75% original and part of the stern and much of the keel are the same original timbers. HMS Victory now rests on specially built cradles so that her normal water line is level with the top of the dock giving her the appearance of being afloat which also now makes it possible for visitors standing at the bow to see her beautifully restored lines, which was used as a pattern for future warships design for many years after her launch. Since the 1930's a continual battle has been fought with the death watch beetle and renewal of the decaying oak timbers. As the Victory was mostly built of oak; these original timbers which were continually getting wet and then drying out were by then badly decayed. These decayed oak timbers were systematically having to be replaced as the scarce and expensive oak was found to be no longer suitable. Also to try and produce new oak timbers of the huge size often required would again mean having to use the inner heartwood part of the oak tree, which, it is now known to decay most readily in such conditions. It was found that to preserve the Victory for many generations to come, timbers had urgently to be found that were both resistant to beetle attack and fungus to prevent this continual recurring problem. In the 1960s teak began to be used in the restoration work which in the 1970's was supplanted by iroko. Iroco which is a tropical hardwood is not only resistant to beetle attack and funguses but just as importantly is produced from sustainable sources from forests which are immediately replanted after felling. Teak is now used for the supporting frames (futtocks) and planking; iroko is used for the beams and mahogany used for carving the Entrance Port. These new timbers, modern insecticides and the now increased ventilation within the ships hull has now virtually eradicated these problems. During the Second World War the ship was closed to visitors and she was stripped of her upper masts and rigging. She narrowly escaped destruction on the night of 10/11 March 1941 when a 500lb high explosive bomb fell into the dry dock and burst just under her port bow, blowing a hole 8ft x 15ft in the ships side which ironically increased the ventilation throughout the ship and helped to reduce damp and humidity inside the ship. After the war her restoration continued and the Victory was reopened to the public. Restoration continues to the present day by a team of highly skilled shipwrights who can still often be found using the traditional tools such as axes and adzes, removing the rotten and worm damaged timbers and then replacing them with exact replica's made from teak or iroko. Whenever possible the ship has been restored and maintained using the correct methods and materials with special emphasis on returning the ship in design, colour and layout to how she was on the morning of the Battle of Trafalgar..
As each one of these original damaged beams were replaced within the Victory's hull a careful record was kept, not only which beam was replaced but in which year it was removed. Without this record once the paint was applied to the new timber it would become increasingly more difficult to work out amongst all the many hundreds of interlocking beams how the restoration was progressing. For over two decades one of these highly skilled shipwrights restoring the Victory, Dennis Weeks kept such a record with each replacement beam carefully drawn onto the plan of the Victory's hull shown below. 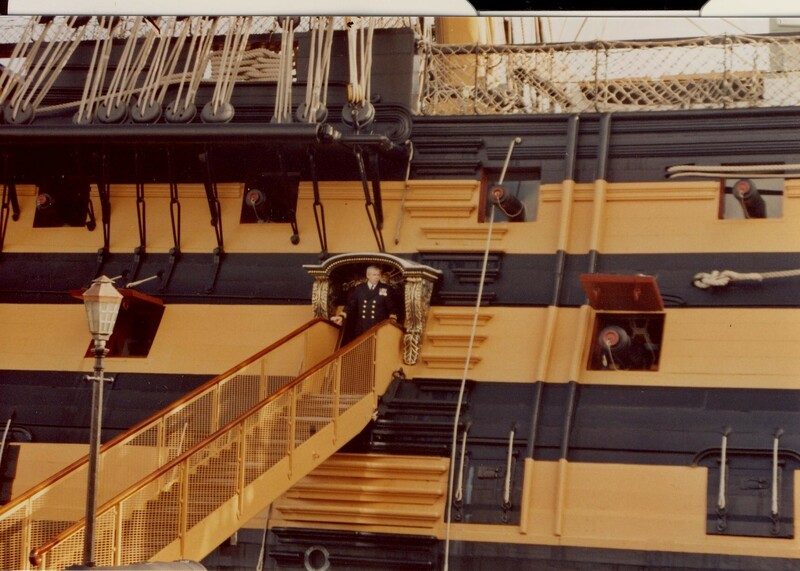 During 1990/1991, Ian G Brennan was commissioned by The Royal Naval Dockyard in Portsmouth to make an exact replica of the original Starboard Side Entrance Port on HMS Victory. The original carved oak entrance port was badly decayed and in many places it was only the thick layers of original old black lead paint that was keeping parts of it together. Whilst Ian was carving this replacement entrance port on the lower gun deck the centuries had also taken their toll on some of the other oak timbers which also had to be removed from within the Victory's hull during the restoration process. These old oak beams were also found to be badly rotten and worm damaged, beyond repair and required replacing. Ian was asked as some of these beams were obviously not in any condition to be restored and then returned to the ship, if he would be able to carve something with them which could then be auction off to help the ships crew with their annual fund raising for the 'BBC Children in Need' TV program, something Ian was pleased to be able to do. 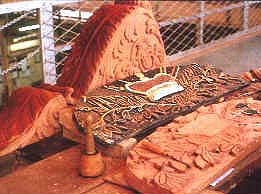 The replacement was to be carved entirely from seasoned mahogany, unlike the previous original entrance port which was carved entirely from oak. Mahogany has proved to be far more durable over the years when used in the large sections now required than oak has proved to be in the past. The majority of work in carving the replacement entrance port was carried out in the No 4 Boathouse which is close to HMS Victory where most of the restoration work on the ship had been carried out. HMS Victory and No 4 Boathouse were the carving took place, alongside one of the ships original 32 lb cannon under repair, along with part of the original badly decayed oak carved scrollwork that had been removed from the starboard side entrance port. 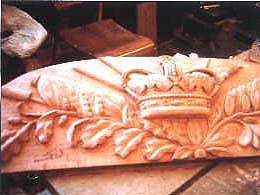 Having used the original oak scrollwork from the Victory as a guide, Ian took many measurements to insure the replacement was going to be an exact replica of the original carved over 250 years ago. The acanthus leaves on the entrance port were deliberately overemphasised to make the detail stand out from a distance especially when all the required layers of paint were applied. Also if the carving were to be to delicate the it may well be broken off during the working life of a 18 century warship. Although Ian usually prefers to use his own carefully selected timber to work on, the Victory's shipwrights had prepared some huge mahogany blocks for him to carve, which were of the very finest slabs of timber all carefully cut to size and planed smooth. His first task in producing an exact replica was to draw the rough layout of the design onto tracing paper rather than directly onto the timber, as any mistakes can be rubbed of easier on the paper than the timber. Unlike the grainy timber, using tracing paper also enabled him to copy the high points of the original accurately. It took around three days to reproduce exactly all the outline drawing of the scrollwork onto the tracing paper and then to transfer this design onto the mahogany block. 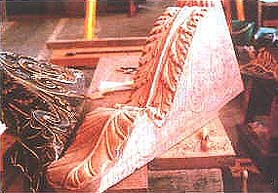 The original scrollwork and replacement was then placed together so any discrepancies between the two could be easily spotted and quickly rectified. 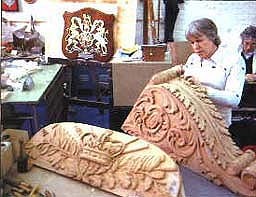 Having now reproduced exactly the outline drawing upon the timber the carving could start. On these types of carving projects Ian tend to considerate more on the spaces between the pencil marks than the lines themselves as these gaps are where all the important first cuts with the chisels are made. Ian started carving the ornate leaves on the edge on the of the mahogany block starting at the bottom, carefully taking measurements from the original and making the comparisons as I go along, working upwards all the time carving each individual leaf so that it would slightly lie underneath the leaf above it. Ian G Brennan putting the finishing touches to his woodcarving of the Victory's scrollwork, with the completed entrance port in position. Amongst his rather large collection of chisels Ian had managed to built up over the years, he found several very old gouges that when used would give a similar finish to the chisels marks left by the original ship carvers all those years ago. Once Ian had completed his work, the entrance port was carefully lowered onto the middle gun deck and bolted in position. The final coats of paint were then applied by the dockyard painters along with the 24 carat gold leaf. 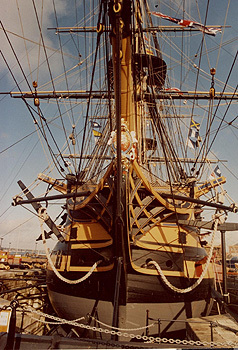 The hugely complex work in restoring HMS Victory and consequently returning the ship to her original design and condition she was at the time of the Battle of Trafalgar in 1805 is virtually complete. The ship now takes pride of place in Portsmouth's historic dockyard where as well as her official naval role she is also a major heritage attraction, with over 350,000 visitors each year coming to see this historic, wonderfully restored and the last remaining first-rate 100 gun warship in the world. Lord Nelson was born in Burnham Thorpe in Norfolk England on the 29th of September 1758 and was the fifth son of eleven children of the Reverend Edmond Nelson. The baby boy was small and weak and was quickly christened Horatio just six days later as his parents feared he might not live. Yet this sickly child was to survive and spend nearly all his adult life at sea, have an outstanding Naval career spanning 34 years and go on to prove to be one of England's greatest ever military heroes. In 1771 Nelson joined the Royal Navy when he was twelve, children of that age were deemed old enough to take up training or apprenticeships and if they managed to pass the examination before the Commissioners of the Admiralty, these boys could go to sea and train as officers and expect to rise to the rank of a lieutenant at eighteen. In Nelson's case three months before his 21st birthday on 11th June 1779 he was promoted to Post Captain. As a captain Nelson was soon to distinguish himself with both his courage and fortitude on many engagements which included the final year of the American War of Independents when he was in command of the 28 gun Albemarle. It was during this period he first gained his experience at Fleet work which was to stand him in good stead in the future. The Nelson legend which grew up over the years owes much to his heroic acts in the face of crippling disabilities that would have held back lesser men. During Nelson's career his many brushes with death included picked up malaria, losing his sight in his right eye whilst commanding an attack to oust the French from Calvi on Corsica in July 1794 and three years later being hit by a musket ball in his right elbow which shattered the bone so badly that the arm had to be amputated. Following his spectacular victory over the French at the Battle of the Nile in 1798, he was awarded the title 'Baron Nelson of The Nile and Burnham Thorpe', thus becoming Lord Nelson. In 1801 his victory at Copenhagen earned him a more senior peerage as a Viscount although he was still addressed as Lord Nelson. Lord Nelson did not officially receive his Order of the Bath until 1803, which was the first investiture of new Bath Knights in Westminster Abbey since 1788. 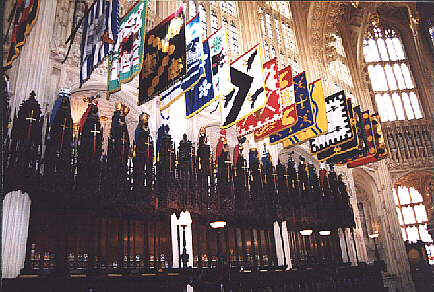 This instillation along with the great pomp and ceremony it entails enables the Knight to be installed along with their crest, banner and stall plate bearing their coat of arms to be placed within this historic Henry VII Lady Chapel. Lord Nelson's Stall-plate which can still be seen attached to the back of the stall he occupied in Henry VII Chapel Westminster Abbey when he was made Knight of the Bath in 1803 (Stall S20). Nelson however had rejoined the Mediterranean fleet by the time of his instillation in Westminster Abbey, so it was received by William his cousin and husband of his niece Kitty by proxy.. Protocol however demanded that the proxy must at the least be a fellow Knight, so William was hastily Knighted. Nelson's highest rank was Vice Admiral of The White and his most senior appointment in that rank was Commander in Chief, Mediterranean Fleet from 1803 until his death at Trafalgar in 1805. Nelson Myths and Legends ; Nelson's unique run of decisive victories including Cape St Vincent, the Nile and the most important battle of them all, Trafalgar in 1805 came at a time when the war for Britain in Europe, against France and her allies Spain was not going well, his . Such great victories made him an international hero. Although his wounds slight stature gave him an air of frailty he was a man of great enthusiasm and vitality, he was a skilled tactician and strategist with tremendous courage and stamina, all these factors along with his very human qualities endeared him to the ships crew. As Nelson is so famous today and was certainly very much so during his own life time, many myths have grown up about him, many however proved to be just that myths, some of these are outlined below. In cartoons Nelson could often be seen looking through his blind eye claiming " I see no ships" this in fact this was a misquotation. In 1801 during the Battle of Copenhagen Nelson's was given orders to attack and destroy the Danish fleet in a battle in which both sides were very evenly matched. At one point Nelson's senior officer who was some distance away, thought the British were about to lose the battle and hoisted the signal of recall, which he thought would safe Nelson from certain destruction. Nelson however being closer to the fierce ensuing action could see the battle was in fact starting to go his way and when told about the signal, Nelson indulged in a bit of his customary play acting put the telescope to his blind right eye said " I really do not see the signal, Damn the signal, Keep mine for close action flying." The British fleet then proceeded to continue the battle in which the Danes were subsequently defeated. When Nelson lay dying from his wounds in the cockpit on board the Victory after being shot at the Battle of Trafalgar he was heard to say 'Kiss me Hardy' or was it kismet ( Turkish for fate) which over the years it had sometimes become known. When Nelson's great friend Captain Thomas Hardy came to say farewell for the last time, as they parted Nelson was heard to say "kiss me Hardy" this moving request was in fact not unusual in those times as men often expressed their affections for each other quite openly especially in such moments of adversity, however to such a great man some people found the kiss to be embarrassing, so the kismet myth was invented. Before he died Hardy did in fact, according to three separate eye-witness accounts, kiss Nelson twice, once on the cheek and then on the forehead. 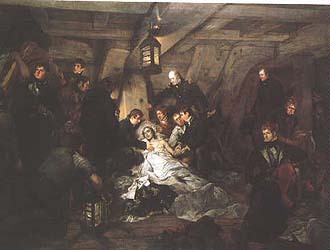 Nelson's crew insisted on their right to take home to England the body of their beloved commander, which had been specially preserved in a cask of spirits of brandy. So, after some temporary repairs at Gibraltar, the Victory slowly limped home. 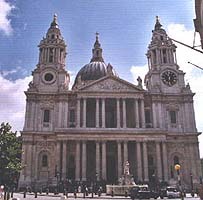 After lying in state in the Painted Hall at Greenwich Hospital, Nelson's body was carried up the River Thames in a spectacular water-borne procession and then on to St Paul's Cathedral. 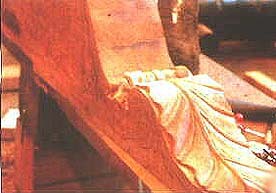 Nelson's body lies in a coffin made from the planks of the French flagship "L'Orient" which had exploded at the Battle of The Nile in 1798. 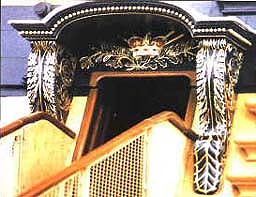 This lead lined coffin inside the sarcophagus was placed within the crypt of St. Paul's Cathedral in London directly beneath the ornate dome that occupies the central position in the Cathedral. .
As the Victory a flagship and the chief officer was the Admiral, Nelson's task was to organise the daily affairs of the fleet and to prepare his subordinates for battle. He therefore played very little part in the actual running of the ship itself. This was the responsibility of the captain, who was assisted by his Lieutenants, each of whom looked after a particular aspect of the ship's routine - such as gunnery or signalling. The junior, or trainee, officers who were the Midshipmen also helped with these duties. Additionally there were a number of specialist officers, such as the Purser, who looked after the supplies, and the Master, who was responsible for navigating the ship..
Over 850 officers and men served in HMS Victory at the Battle of Trafalgar. Each of these men had a clearly defined set of duties to perform. Over half the ship's company at Trafalgar were made up of volunteers. All the officers were full-time professionals, Royal Marines and boys had all joined voluntarily. However although over two hundred of the sailors had indeed joined up of their own accord many did not. As in most wars there were never enough volunteers to man all the ships required for a fleet. With the real possibly of being away from home and your family for many years and the rumours of squalid conditions and harsh discipline on board warships of the line, along with the popular myths of rats and weevils in the ships food, conscription was often necessary. Although British warships kept live animals on board as far they could, much depended upon the captain as to how often he re-supplied his provisions. Commanding the Mediterranean Fleet blockading Cadiz, Nelson routinely detached ships from the Fleet to replenish and rearm at Gibraltar to make sure that the crews stayed as fit and healthy as could possibly be achieved. Captains did often try to make fresh food available for the crew but this was never easy and "dry" rations were often all that was available on a long voyage. Foodstuffs may well have been in the hold for months, even years and would have been unpalatable to say the least. However at least the crew had three meals a day however grim they might be and along with their daily rum ration as well as being pay for their services, things were not all bad. Through special laws passed by parliament certain clearly defined types of men with maritime experience were required to serve in warships like the Victory. These laws were often rigorously enforced by the infamous 'press-gangs' who were armed gangs of royal marines and sailors who frequently roamed the streets of the sea ports looking for likely new recruits who were then 'pressed' into service. Perhaps the real problems of recruitment can be well illustrated when convicted men when given the choice between being locked up in the primitive conditions of an 18th century jail or join the Navy, many chose jail. 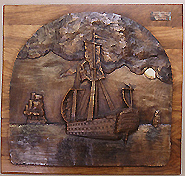 The main body of the ship's company was made up of the seamen. They were divided into Able and Ordinary Seamen who were the most experienced and Landsmen who were men who had little or no previous experience at sea. There were also many boys on board, some of them as young as ten years of age; many of these boys being orphans were sent to sea to learn a trade. There was also an elite of around 150 Royal Marines which were used to maintain discipline on board as well as in battle providing accurate small arms fire, often from high up in the rigging. In the early summer of 1805 Napoleon launched his ambitious plan to invade England, which would involve concentrating of all his available warships, a huge flotilla of transports and his especially raised invading army. Fortunately for Britain unlike his conquering army on land, Napoleon never fully understood the problems in moving a great fleet of ships around the high seas, and also completely underestimated the British naval commanders of the day, who being thoroughly at home in sea warfare under the command of Lord Nelson, decisively out-manoeuvred him at every turn. Nelson's arrival off Cadiz caused great excitement throughout the fleet with a sense that a decisive moment was soon approaching. On 19 October the allied French and Spanish fleet sailed from Cadiz under the command of the French Vice Admiral Pierre de Villeneuve. The British fleet shadowed the allied fleet until it was well clear of the port. On the morning of 21 October off Cape Trafalgar the English fleet prepared to move in to attack. Nelson signalled fleet to prepare for battle and make more sail. The ships were formed into two columns; the column on the left was led by Vice Admiral Cuthbert Collingwood in HMS Royal Sovereign and the right column by Admiral Lord Nelson in the Flagship HMS Victory. Nelson, who had spent the preceding days briefing his captains at dinner parties in the dining cabin on-board Victory, issued a special memorandum setting out his tactics in detail, although he was outnumbered he aimed to attack in three divisions. These would break through the allied line in three different places dividing it into smaller and separate groups each would then be forced to fight a separate battle. At eleven forty Nelson informed his second-in-command that he intended passing right through the enemy's line to prevent them from retreating into Cadiz, however the tight formation of the Franco-Spanish ships prevented him from doing so and the signal was followed by 'make all sail with safety to the masts'. During the battle of Trafalgar, Nelson's plan was to sail straight into the line of the enemy fleet although she would have been exposed to the concentrated fire of five allied ships for over an hour without being able to bring any cannons of her own to bear to defend herself. Around fifteen minutes before midday Nelson's famous signal broke out to the Fleet' England expects that every man will do his duty' shortly followed by' Close Action' Nelson ordered the signals to be kept up and they remained that way until they were shot away. by one the ships in Nelson's division pushed through the gap the Victory had made and began to attack the ships of the allied centre. Each of Nelson's Captains’s had orders that once they had broken through the lines they were to find their own enemy ships and fight their own separate battles. Although it was a high-risk plan Nelson relied on the superior morale and gunnery training of his crews which could maintain a far more deadly rate of fire than his opponents, these tactics eventually proved to be decisive. As he was carried below decks, Nelson requested his face be covered so his men could not see he was hit, he was to lingering down in the cockpit in great pain for three hours. He fortunately however lived long enough to hear that he had won a decisive victory, something which Britain so badly needed and for which he had planned so carefully. The victory's crew insisted on their right to take back home to England the body of their beloved commander, which was to be specially preserved in a cask of spirits of brandy. Although the Victory was potted with shot and some being of heave calibre very few had penetrated the ships hull. Every one of the thirty-three British ships returned from the battle and out of the forty enemy vessels at Trafalgar, nineteen were taken as prizes, of which only four were saved. After the battle off Cape Trafalgar near Gibraltar, the damage was listed in The 'Remark Book' by Mr. R.F Roberts who was a Midshipman on the Victory. "The hull is much damaged with shot in a number of places, several along the water line. Several beams and riders, knees shot through, and a broken starboard cathead. Timbers of the Head and Stem full of shot with lots of parts damaged. Chains and Channels shot away, the Mizzen mast shot away nine foot above the deck, bulwarks shot away, the main mast was full of shot and sprung, the Main Yard gone, the main Top-Mast cap shot away. The Main Topsail mast yard shot away. The Foremast shot through in many places, the Foreyard shot away, Bowsprit, Jib Boom and cap shot-away. Spritsail yards and Flying-jib boom gone. Fore and Main Tops shot away and the ship taking in 12 inches of water an hour." From this report by the midshipman it was clear the Victory was in a serious condition, during the long and risky approach into battle HMS Victory was consequently very badly damaged and then the battle over, the ship took another pounding in a great storm and had to be towed to Gibraltar to be patched up. 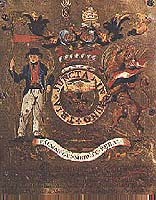 Eventually seven days after the battle the Victory arrived in Gibraltar. After temporary repairs after a difficult journey on the 4th of December the Victory arrived back in Portsmouth Harbour. The battered old ship eventually was to returned to her birthplace, Chatham in Kent where she underwent the second major refit of her long career. Her steering-wheel, shot away during the battle, was replaced with one bearing the words of Nelson's famous signal; 'ENGLAND EXPECTS THAT EVERY MAN WILL DO HIS DUTY. ' while a special plaque was placed at the spot on the quarterdeck where he fell. Unfortunately although the Battle of Trafalgar did not bring the peace the British had hoped for it did inflict a crippling blow on the French navy, breaking France as a maritime power and freed England from the threat of invasion, eventually leading to the collapse of the French Empire and the downfall of Napoleon in 1815. More importantly however it established Britain as the world's supreme naval power for the next hundred years. 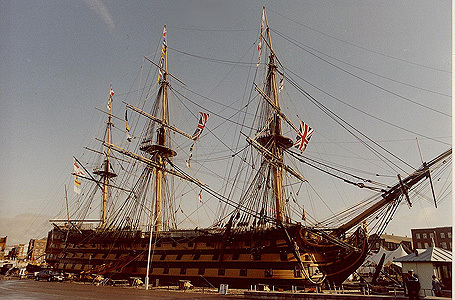 "If you ever get the opportunity to visit Portsmouth in Southern England, I would thoroughly recommend a visit to the Royal Naval Dockyards and join the 45 minute guided tour to see for yourself HMS Victory in all her splendour. 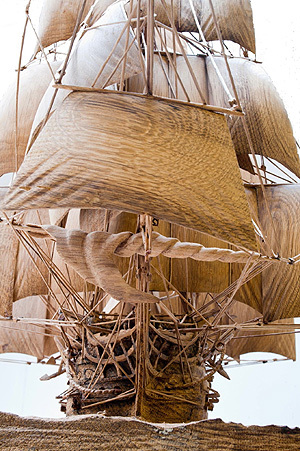 The excellent work that the various generations of highly shipwrights have done since the 1830's is simply something that has to be seen. The ships crew, staff and shipwrights working on the Victory over the years have succeeding in restoring Lord Nelson's famous Flagship back to how she would have looked in her former glory in 1805, and when you eventually leave the ship the very last thing you bang your head on will be my own small contribution to Great Britain's Naval heritage".